Download includes jsDatePick standard full/minified, and jsDatePick for jQuery full/minified. We'd also be overjoyed if you'd write a blog post, or link back to our site. We do hosting , graphical design , simple and advanced site buliding , eCommerce deployment and integrations and much much more! See working examples and full script configuration details on the date picking implementation page. use JSDATEPICK code for $50 off! Fixed a bug with the preselected date option. 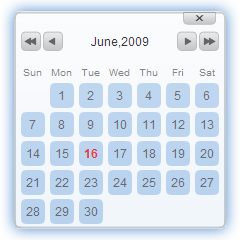 Calendar closes also when clicking anywhere else on the page and not just on the X button. Fixed a bug with the yearsRange feature. Added support for easy date format switching and it's divider. Added minified and full jQuery versions. Added possibility to change the day the week starts on. IE6 and IE8 support out of the box. Minified versions weigh only 26kb!